When we were kids, my brother and I were addicted to Elfquest comics. We didn’t really know much about comics in general, but at a time when the WaldenBooks and B. Dalton stores in our local mall didn’t have comic book sections, they had a handful of graphic novels including the first few Elfquest books. And after reading the first one, we were hooked. Now, the thing about comic books is that many of them never seem to end. Every month or so the authors will put out another short opus. But if you’re waiting for the next graphic novel, you might have to wait for a year or longer. And since we didn’t realize that there were monthly installments, we only bugged our parents when the latest graphic novel was released. Looking back, I’m amazed my impatience didn’t kill me. 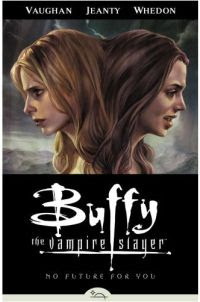 After finishing my month of Buffy watching a few weeks ago I decided to order the first graphic novel of Buffy Season 8. You see, a few years after the show ended, BTVS creator Joss Whedon decided to continue telling the story in comic book form. And while I didn’t rush out to get the first issue, my curiosity finally got the better of me. So I ordered The Long Way Home, the graphic novel containing the first 5 issues of the new series. It arrived yesterday and I remember one of the biggest problems with comic books: You can read them very, very quickly. I was through the book in about an hour and when I wandered over to my computer to order the next installment, No Future for You, I realized that it won’t be released until June. This graphic novel will cover issues 5-10, which are all available already. And so now I have to decide whether to spend $2.99 per issue for those comics plus #11 and #12, or whether to wait a few months. I’m going to try to wait, because as much as I want to know how the story turns out, I can’t imagine how agonizing it would be to have to read just one issue at a time. They’re just so… short. As for The Long Way Home, it was really quite well done. I loved the end of the TV series. It just left the door open to so many possibilities that I wasn’t sure I wanted to know what happened afterward. But the writing in the comic book is strong, and you can almost hear the actor’s voices when reading the lines. Maybe I’ll go and read some Elfquest comes while waiting for June to come. I read 10-12 different series, publishing on schedules that seem almost random. Brian Wood’s DMZ comes out consistently, and so did Seagle & Cloonan’s American Virgin (before it was mysteriously cancelled). A lot of other stuff is more sporadic, so it really does take a dozen books to make sure I have a few to read every week. I remember you two and the Elfquest novels! What a hoot you were. At least you both became more interested in reading for pleasure after they came out.